As I'm sure many of you are already aware, Marilyn Leavitt-Imblum passed on August 14th. Many of you will recognize her work from the Butternut Road and Lavender and Lace product lines. 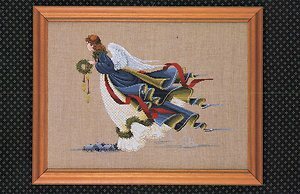 My first stitching piece that wasn't a "pre-kit" was her Angel of Freedom....back in 1989.....and I can still remember the joy I had in buying all my new skeins of floss, sorting them out and getting everything ready. I will have 3 drawings, one for each chart. Oh my goodness that is so sad, such a loss. My first big project Nantucket Rose was designed by her also. I'm a fan of her daughter designs, I'm a Pixie lover hehehe So, I won't enter my name for your giveaway, I will leave a chance for someone else who would love to stitch one of these designs :) Good luck to everyone!! I'd love to be entered for any of these lovely charts . Thanks . Oh that is so sad! I have all of her celtic princesses and have finished winter and am working on spring right now. I also have a Santa Claus pattern that probably was designed by her, but I'm too lazy to go upstairs and check. I would love to be entered in your giveaway, even though it's highly doubtful I will finish all of the ones I have already! It's hard to choose one chart, but I think #1 Angel of the Sea would be my choice. My email address is CNewton724@gmail.com. I am really going to miss her designs! I am a follower and would love to be entered into the drawing for Earth Angel. hi, it is truly a very sad news.i am so sad. i love earth angel so much. Oh how sad! I think it's very sweet how you are remembering her. I would love to be entered! Please put my name in for #2, The Second Angel of Freedom. Wow, wonderful giveaway. Sad news. I would love a chance to win Angel of the Sea. Thank you so much. I would love a chance to win either of her charts. I was very surprised to hear of her passing. Her designs are so pretty. Such a talented designer. I would love to be entered in your giveaway. I am a follower. My name is Jennifer and my e-mail is craftyjenny28@yahoo.com. My first choice is Angel of the Sea. All of the charts are really lovely. I am a follower of your blog. I am interested in #3- Earth Angel. She will be missed. I have never stitched one of her design yet. I just found one in my stash bin. It is called, "Spiritdancer". I will stitch it in her memory ...it is a huge design though. I would love to be entered in your drawing. My name is Jennifer my email is jennilynn1973@gmail.com. My choice for chart is #2 The Second Angel of Freedom. She will be dearly missed. I just love her Angels. Please enter me in your giveaway. I am a follower. My choice of chart is 2# - The Second Angel of Freedom. Such sad news - she was an amazing artist/designer & has left behind a wonderful legacy. 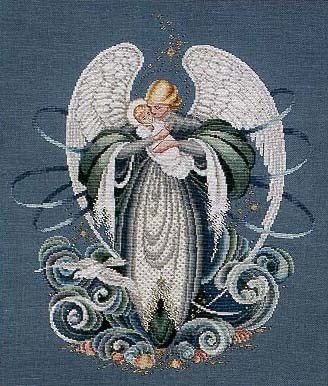 I have admired her designs from afar but never stitched one yet, although I do have a couple of her charts in my stash. I would love to enter your giveaway - all 3 designs are lovely but think Angel of the Sea is my favourite. My email address is in my profile ;0). Thank you for hosting such a lovely giveaway. Good luck to everyone who enters. 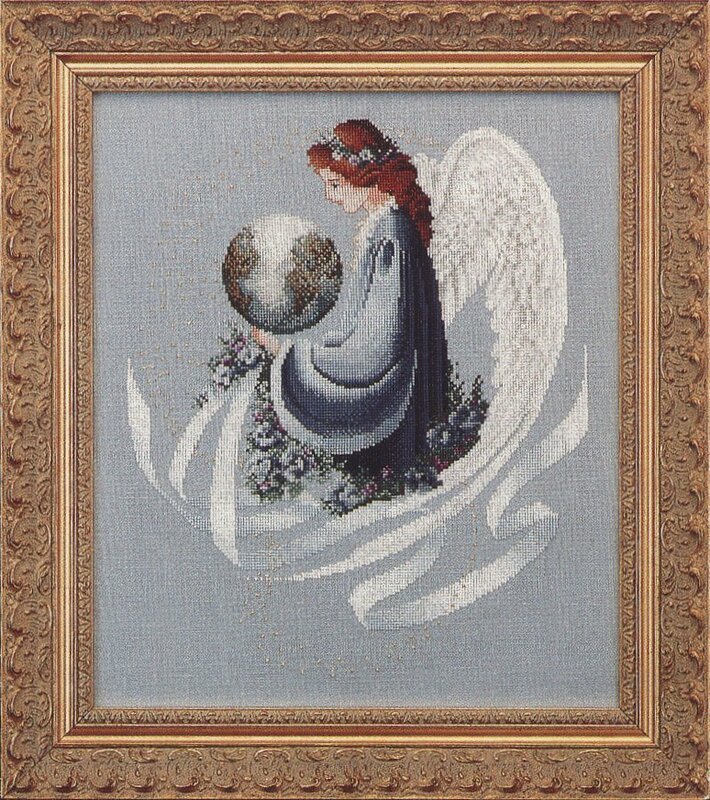 I would love to have a chance to win "Earth Angel"
A new follower here, returning the visit to my blog! I really like your rotation list, I may have to do that myself!